Things started off well enough in December, I was drawn first in the HR lottery, ran some road races and even managed a 5k PR with no speed work. 2016 was shaping up to be a strong year. However, as it turned out, the good times were short lived. In January, I began to struggle on nearly every run. Lack of energy, light headedness, and general weakness seemed to plague each run with greater frequency and intensity. It became quite discouraging, as every time I tried to run with friends, either I couldn’t keep up, or I just had to abandon my effort and head back early because I felt so bad. As May rolled around and training was still at a standstill, I decided to head to Mammoth to at least get my altitude acclimation back and to also go see my physical therapist and miracle worker, Tim Tollefson. He straightened my issues out last year before Hardrock, and I hoped he could do the same again for me this year. As it turned out, we would only get three sessions in, but whatever he did, set the gears in motion for my comeback. I was already noticing improvements in speed just while out on hikes, and for the first time in months, could even fake running again on downhills. At the beginning of June, I showed up in Silverton. My plan was simple, jam an entire winter and spring of training into seven weeks. Sounds plausible enough, right? Good, because that’s my only hope of finishing. On my first day back in town I decided to do what I always do when coming back, hike Grant Swamp. It was a pretty good snow year here and skis would have been the more appropriate tool for the job. The route was nearly covered in 100% snow. The dogs sure were stoked! For me, it was slow going and I knew I had a lot of work and very little time to do it in. Over the course of the next few weeks, I got out five to six days a week and started piling on the vertical. As the snow melted, I was able to get higher and higher. I started to feel pretty solid running uphill on the dirt roads up to 12,600’ and was doing well bombing some of the downhills, which for this years direction, was important. The one thing I was worried about, however, was lack of long runs. I hadn’t done anything over 15 miles since November and here I was a few weeks out, with really no true endurance base. Doubt was constantly on my mind. How was I really going to do this? With three weeks to go, I bounced some ideas for some long runs off of my friend and nine time finisher Scott Brockmeier. On the first day of the week, we did a 20 mile out and back from Silverton to the Putnam Divide area. I felt pretty decent, but seemed to feel off as we got over 12,000’, even though I was totally acclimated. Later in the week, we set off for a big day with Willie Roberson and his dog Brutus. We did 31 miles going from Silverton to Chapman, then back over Ophir Pass. It rained half the time, but in the end, we all finished pretty strong, and ultimately, it gave me the confidence that I could go the distance. I figured based on how I felt other years after the first 50k during the race, I should be fine. Or so I hoped. With two weeks to recover, I wondered if I had done enough. 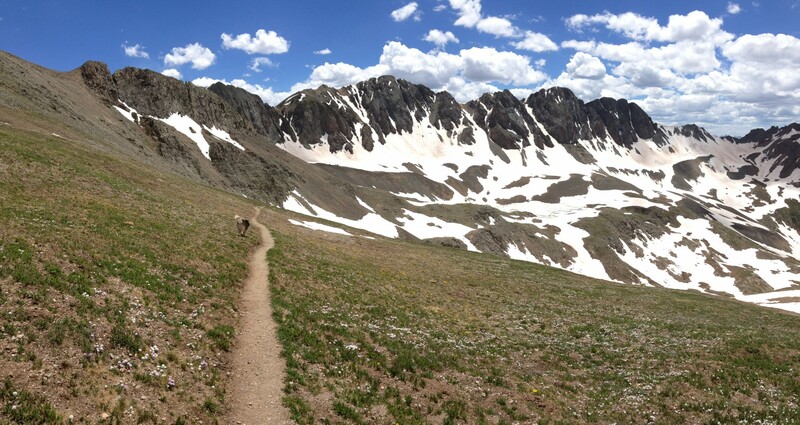 I had squeezed in multiple fourteeners, thirteeners, many passes, fast days, slow days, rest days, etc. But I was still worried. With two weeks out, I set off for Marble, CO to spend four days at Trail Runner Magazine’s photo camp. I figured it would be active recovery. The whole time I was there, my left hamstring became sore and was as tight as a high tension wire. Not good. In addition, we were going non stop from 6:30am to 9:30pm and I really wasn’t catching up on rest. More red flags in my mind. Race week came and fortunately, my flared up hamstring seemed to subside and I tried to get into some sort of routine to rest and focus. It seemed like for whatever reason, I couldn’t stop the distractions. It wasn’t until Wednesday when I went to Durango to pick up my good friend and pacer Dennis Williams, that I finally felt like I could breathe and center myself. Race morning arrived and before I knew it, we were off. I was excited to finally be out there doing instead of thinking. The early miles to the creek flew by quickly and effortlessly, as they should. As I approached the Putnam Divide, well north of 12,000’, something was definitely off. My breathing and heart rate were all wonkadoodle. My climbing really slowed and many could easily pass me. Once over the divide, I was able to descend ok, re-passing many, however, every time the trail went back up, I felt unbelievably weak, like I was a completely different runner from the one who was gliding downhill just moments ago with ease. This was concerning. How was I going to deal with this for eleven more passes and a peak? I kept telling myself to be patient, and that it’ll pass. When that didn’t work, I’d look down at the little #6 I drew on a vertical stabilizer on my race number, which represented Blue Angel Jeff Kuss’s F-18 hornet that he perished in while trying to avoid crashing into a populated area, potentially saving many lives. We pull strength from many areas to get through an event such as this. About 2/3rds of the way up Grant-Swamp I was feeling flat. Normally the wildflowers and amazing views are a big pick me up, but I just was cooking in the heat and was struggling to feel like me. Out of the blue my trail brother, Billy Simpson and his son Max appeared. Billy saw I wasn’t doing well and just sat me down and talked with me for a few minutes. We’re both no strangers to suffering out here, and lord knows, last year we shared some epic moments that always left us saying, “F-in’ Hardrock…” At the same time, my friends Scott Brockmeier and Doug Seaver caught up. All of this seemed to temporarily ease my mind and we set off to finish the climb. As we neared the top, I started to feel a bit stronger and was catching back up to Andy Kumeda, who had passed me at the KT aid station. All smiles, despite feeling pretty awful. Photo by Myke Hermsmeyer. Cresting the pass, I picked up three rocks to place on the cairns erected on top for Hardrockers, Joel Zucker, John DeWalt, and Roger Ackerman(whose ashes I spread and carried the whole way during last year’s race). I began to run across the ridge on top and then passed Andy and a slew of runners who were staring nervously at the heinously loose and steep descent down the pass. I never stopped but just dropped in like I was launching off into a couloir as if it were a ski run. I blasted down, arms flailing, skiing the scree, falling, flying, falling, bounding some more till I hit the bottom and stopped to empty my shoes. Most fun I had had all day! Riding my high, I caught back up to Paul Sweeney and Ricky Denesik, and cruised comfortably down to the Chapman Aid Station and mile 18. Kirk Apt was there and we chatted for a few moments as we prepared for one of the toughest climbs in this direction, Oscar’s Pass. There are a number of words that can define Oscar’s, amongst them, hot, steep, rocky, biting flies, hot, steep, rocky, biting flies, well, you get the point. I had a nuclear meltdown on this climb in the heat of 2006, and I was hoping this wouldn’t happen again today, especially in light of how bad I was feeling on all the climbs. As we cast off and started climbing, luck was on our side today as some clouds were blunting the effects of the heat and direct sunlight. Oscar’s is a grind. 1000’ per mile climbing with no breaks and few trees. At times it feels like you are in a slow motion race, it takes forever to catch people or to be caught. I lost sight of Paul, as he was clearly feeling bad and I continued to plug away with Ricky and Kirk. We caught a few people and eventually the top of the pass was in sight. I also took note at this time of the tremendous trail work that was done the week before the race. This section had become terribly rocky(it cuts across a talus/scree slope) and the Hardrockers that had worked on it made it a virtual freeway at 13,000’. With Oscar’s behind, I set off for the wonderful seven mile descent into Telluride. The trail is mostly beautiful single track that winds though open tundra, cliffs, creeks, and seemingly infinite fields of wildflowers. About halfway down I saw Scotty Mills and his pacer Angela Shartel. I slowly reeled them in with about 2.5 miles to go before Telluride. Soon thereafter, I caught up to then 19 time finisher Blake Wood(now 20), and we ran together the remainder of the way to the aid station. Telluride(mile 28) is one of the four “big” aid stations and is a good place to really calorie up, and take inventory. Time wise, I came in somewhere between my PR year of 36 hours, and one of my 39 hour finishes. All in all, not terrible, considering I was having a rough day. While in the aid station, my heart rate was high and my breathing heavy. I just couldn’t get relaxed. I was just thinking about calories and the 4500’, five mile climb up Virginius Pass in the blazing heat. In fact, it’s such a blur now, I can’t even think who was there helping me. I think George Velasco was there and I know my friend Emily from Florida was there. I do recall apologizing to everyone for being a space cadet, because my mind was going 1000 mph. It was probably a bit after 3pm when I left the aid station. My plan was to climb slow but steady. Avoid redlining so that the heat wouldn’t kill me and I’d have strength to run well down Camp Bird Road on the other side of the pass. This plan seemed to be working as I steadily made my way up to tree line, passing a few people on the way. After the reaching tree line, the steep trail becomes wicked steep and I could see people ahead resting frequently. Pretty soon I became one of those people resting frequently, which in all of my prior years, had never happened. At this point, all I could focus on was reaching Mendota Saddle, because after that, the trail contours gently to the pass at near 13,000’ along the slopes of Marshall Basin. After what seemed like an eternity inching my way up, I hit the saddle then began to pick up a little speed catching a few runners before finally reaching Kroger’s Canteen and Virginius Pass at 13,100’. Kroger’s is always a special spot on the course. It is an aid station that sits on St Sophia Ridge in a small notch. It’s so cool it even has a waitlist for volunteering. As always, ten time finisher Roch Horton is there to cheer you up and inspire you to cruise through another 68 miles of fun and adventure while offering you mescal and pierogees. I was pretty hammered, but stoked nonetheless to be there as the nasty climb up Virginias was now behind me. Ok, time to move on. The first pitch off of Virginius has a rope, and this year is mostly sand instead of snow. Another runner was contemplating going down but was hesitating so I hopped up and took off down the slope. After the first 70’ I sauntered over to the rope and used it for the remaining 100’ as I descended down to the snow. Pitch two went quickly and a short bit later I stood atop the final steep pitch down to the football field that marks the top of the Virginias Mine. At this point I realized I had bought the wrong version of Hoka, mine were the street version of the Stinson instead of the trail version which has better tread. The descent in my street shoes was a little hairball as I slipped my way down. Wasn’t scary, just couldn’t go as fast as I wanted because I couldn’t trust my shoes to grab properly. I really don’t want bacon, Dennis. And Dom, well, it’s anyone’s guess what he’s up to. Coming into Ouray was a blast! Katie and Dom were to first people I saw as they were waiting right where you come off the trail…I could hear many people calling out my name. It’s always exciting to feed off the energy after having been alone on the trail for so song. Dennis, June, and George were all there as well as Jill and Marisol who were waiting for Andy, who was now somewhere behind me. For the first time in the race, I was pretty happy and looking forward to moving on and getting started up the longest pass of the race, Engineer, which climbs from a low point in Ouray of 7800’ to over 13,000’ in some ten miles. Before I took off, Marisol quickly worked on my hamstrings and quads while Dennis tried to feed me bacon, which I refused. In a massive dose of bittersweetness, I left with my pacer Katie DeSplinter Grossman bound for Grouse Gulch. I say bittersweet, because Katie sat at number one on the waitlist since June 1st, and we were all sure that she was as good as in the race. Unfortunately, the unthinkable happened and no one got in off of the waitlists. I was crushed for her as I know how bad she has wanted this. As difficult as it was to ask, I was thrilled that she accepted my invitation to come out and pace, as she had played a big part in making my last three finishes special. As luck would have it, Katie got a lot more than she bargained for this year. The plan for Engineer was slow and steady. Save myself for the second half of the race. All was going fine for the first few miles when all the sudden I went, “Ut oh,” then was on the ground in the dark fertilizing the wildflowers. Ok, that’s never happened here before. I guess the heat of the day finally caught up to me. This was repeated many times over the next few hours and while I always felt better afterwards, I was getting weaker from a serious lack of calories. I recall spending lots of time on the ground talking to myself, trying to snap out of it, and as always, press on. There’s no quitting at Hardrock, and I most certainly wasn’t going to start now. Upon arriving at the aid station, trying to get calories was my number one priority. Unfortunately, this was no easy task, given how queasy my stomach felt. Scott and Doug came in shortly after and we all sat around the fire trying to stay warm while recharging our batteries. I was pretty out of it, but nevertheless, managed to down some hot chocolate, Mountain Dew, and Ramen, good enough for the 1.5 mies to the pass. Leaving Engineer I felt pretty good, and was trying to take advantage of being able to move quickly over the reasonably flat terrain leading up to the final headwall of Oh Point and that blinking red beacon. All went pretty well up and over the pass and on down to Grouse. I shuffled a little on the downhill, puked once more, but really just tried to conserve energy for the big climb up and over Handies Peak, which was the next attraction on this San Juan tour. Grouse Gulch was a blur of shivering, talking to myself, eating, more shivering, but mostly looking inside, wondering how I was going to get up out of this cot and get it done. After a long 71 minutes of downtime, Dennis and I finally cast off in the early morning darkness for Grouse-American Pass and Handies Peak. The sun greeted us somewhere on the way up Grouse-American and really, the climb from there on up to Handies was uneventful. Low and slow, trying to conserve energy and get my stomach back. Normally it is the middle of the night/predawn when I’m on Handies, but I was glad for Dennis to have the chance to see it in the light. This was his first time in the San Juans, and his excitement for the area was a definite boost to my flatline mood. About an hour later, we arrived at Burrows Park and for the first time in a while, I could eat. Burrows was a fun aid station. Yitka Winn was there and everyone was in a great mood. In a surreal moment, this girl who I had never met, Yvonne says, “you have such beautiful dogs,” or something like that. I’m like, “whoa, how do you know about my dogs, I have no idea who you are…” The wonders of social media proving yet once again, my dogs are more well known than me. About an hour or so later we made it to Sherman, which is mile 71.8. Sherman is a bit like the Valhalla of aid stations. Everything you could ever want is there, and everyone is so happy to get it for you. All I saw was that there were pancakes. Anyone who knows me knows I have a fetish for pancakes at ultras in the late miles of the race. I cried one year at Angleles Crest when they didn’t have pancakes anymore at Idlehour(mile 84). Today I ate five. The world just became a better place. The wildflowers up out of Sherman were outta control. In some spots they were nearly as tall as us. Dennis was like a kid in a candy store, marveling at the beauty around him. Totally high on pancakes and syrup, I was moving reasonably well, and had stepped out from the shadows of doubt into the light of possibility. I knew we would get it done, the question now was, how long would it take? It was still too far out to push, so steady as she goes was the throttle setting for now. Dennis continued to bask in the beauty of the the Pole Creek area, while I was slipping into a state of decline. A steady, cold, headwind was making an already tiring trek even tougher. It was quite the contrast from yesterday’s searing heat. With a few miles to go until the aid station, I needed to get off of my feet for a minute to just, well, get off my feet. Laying in the grass, I struggled to eat a cookie. I knew I needed calories, but at this point, eating anything was a chore. Onward we pressed. About a mile out of the aid station, Denise Bourassa came by with the runner she was pacing. She tried to get both of us to shuffle, and I felt inspired to try and kick it up a notch. The remaining distance to Pole Creek went by pretty quickly and upon reaching the aid station, I could finally begin to smell the barn with only about 20 miles to go. I could feel the pull of the rock. 23 out. In and out in less then a minute. The terrain to the next aid station, Maggie Gulch, is pretty moderate. Flat at first, then a rather easy climb up to Maggie-Pole pass at roughly 12,500′. I begin hiking as quickly as I could. One by one, I began to catch people. As we began to climb, I was now passing by groups of runners as if they were standing still. I don’t know what had changed, but I now felt as if I had zero miles on my legs and had unlimited cardiovascular power. At one point, I was even running around people to pass them. Near the top, I passed both Ricky and Kirk, who I had last seen on Engineer Pass. At the top I caught up with Christopher Agbay and we cruised down into Maggie together. Dennis caught up while we were heading down and mentioned how I was trying to kill him and that his lungs were on fire. He then ran ahead full speed to make an urgent pit stop at the aid station. Just before I arrived at Maggie, I made a quick stop to pay respects to my friend Roger. The year before, I had buried the remaining vial of his ashes near a bush just before the aid station and marked it with a small cairn. I found the cairn and thanked him for watching over me and I hoped he could see what a beautiful day it was. Up, up, and away we went, Dennis falling in behind me. I caught a few more people on the steep, but short climb to Canby at 13,200′. The ridge running after that above Buffalo Boy is pure heaven in the afternoon light, made all the more special knowing there are only two passes between you and Silverton. Running alone, we crested Green Mountain, and I ran and hiked steadily all the way down to Cunningham. Along the way, Christopher passed by me like he was being chased by a herd of sheep dogs. Speaking of sheep, the entire mountainside to our right was covered with over 2100 of them, brought up the week before the race. Little Giant. I’d been waiting for this moment for 37 hours. Normally a 2700′ climb in 1.9 miles up to 13,000′ would be daunting, but I was chomping at the bit to get started. I wanted to get to the top with daylight so Dennis could see how beautiful it was. With bagels and cream cheese in hand, we set off to complete the journey. Grinding up this climb, I realized I burned through most all of my reserves on the hammer-fest out of Pole Creek. I had only one climbing gear left, but it was getting the job done. I could see PoDog ahead and was slowly catching up to him and his pacer, Jim Sweatt. I topped out alone on the climb in about 1:25, a little slower than normal, but whatever, it was done! The post sunset light was dreamy, and shortly thereafter, Dennis popped up on top of the pass. We looked around for a moment, then set off across the saddle to drop down the sketchy single track leading to Arrastra Gulch. About halfway down, the single track, I donned my headlamp and hiked/shuffled a little till we hit the rocky dirt road leading towards Silverton. I caught up to PoDog and we chatted for a minute then shuffled on by at a casual pace until we hit the left turn and crossed Arrastra Creek. For whatever reason, the dirt road seemed to fly by this year. MoMo was supposed to meet us there with a PBR, but all there was was darkness and crickets. The final three miles is beautiful single track and is a nice gentle way to end the tour. I have done this section so many times with the dogs, that I new where I was at all times and was calling off distances to Dennis. In some ways, I felt more like a tour guide at this point than a runner. Before we knew it, we were at the Kendall Mountain Ski Hut, which signals that end of the trail and the entrance to town. I knew my time would be around 41 hours, so I didn’t feel any need to run harder than I already was. As we crossed Green Street then onto Reese Street, Katie and Dom were there and the four of us ran towards the rock together. It was hard to believe the end was was in sight. This is the moment you dream of and what keeps you going when things are at its darkest. We did it. It truly takes a village. I owe innumerable thanks to my friends, who selflessly gave up their time to take part in this journey, and in particular, June Uhlig, who took care of my dogs and brought them to the finish, shuttled Dennis around, and provided all sorts of support, both tangible and intangible. Dennis and Katie, whom were the greatest pacers/friends anyone could ask for. I hope you enjoyed partaking in my suffering, you sure made it a more enjoyable experience for me. This entry was posted in Uncategorized on July 27, 2016 by howiestern. Great writeup, Howie….rest up, it’s almost time to begin getting ready for next year!